The current period of sea level rise is caused in part by the natural temprature cycle and shift from the last glacial maximum. Due to natural climate change, temperatures have risen and the great ice sheets of North America, Greenland and Eurasia have shrunk in size. This water storage is now found in oceans and has lead to a rise in sea level of more than 120 meters. However, the rate of increase has fallen dramatically over the past 6000 years. The rate sea level increase of today is associated with the accelerated greenhouse effect caused by human activity. Anthropogenic causes, such as industry, aviation and domestic reliance on fossil fuel based electricity, seems to be the most likely cause of recent global warming. This in turn has caused increases in ocean temperature, estimated to be an average of 0.33 degrees celcius in the upper portions of the ocean to 700 meters compared to 1870 ocean temperatures. Sea level rise is largely caused by melting ice sheets but a significant factor to consider is also the thermal expansion of ocean. This change is sea level due to a change in storage in ice or ocean is called eustatic change. A rise in sea level because of a fall in ice storage is called eustatic rise and a fall in sea level beacuse of rise in ice storage is called eustatic fall. A second process of sea level change relates to a process called isostatic adjustment. Isostatic adjustment refers to a change in the equilibrium of the mantle in relation to the weighting above it, caused by changes in ice sheet cover. Isostatic recovery refers to a relative fall in sea level, due to the rise of the land mass as result of ice sheet melting. Isostatic fall relates to a relative rise in sea level due to a fall in the land caused by ice sheet growth. Emergent coastlines form as a result of a (relative) fall in sea level. This may be as a result of greater ice storage, but in today's context they form as a result of isostatic recovery. Isotatic recovery creates a range of abandoned or relic coastal landforms that formed at the point in time aand space that they were at the coastal margin. They now stand some distance away from the marine zone. These landforms include, raised beaches and wave-cut platforms, relict cliffs with typical cliff features and coastal plains. A good place location to observe these coastal features is is in Wesern Scotland. Current rates of recovery in the Forth, Clyde and Tay valleys are thought to be between 1.8 and 2mm per year. This fall in relative sea level has helped form the sort of coastal features that can be seen in the photos below. 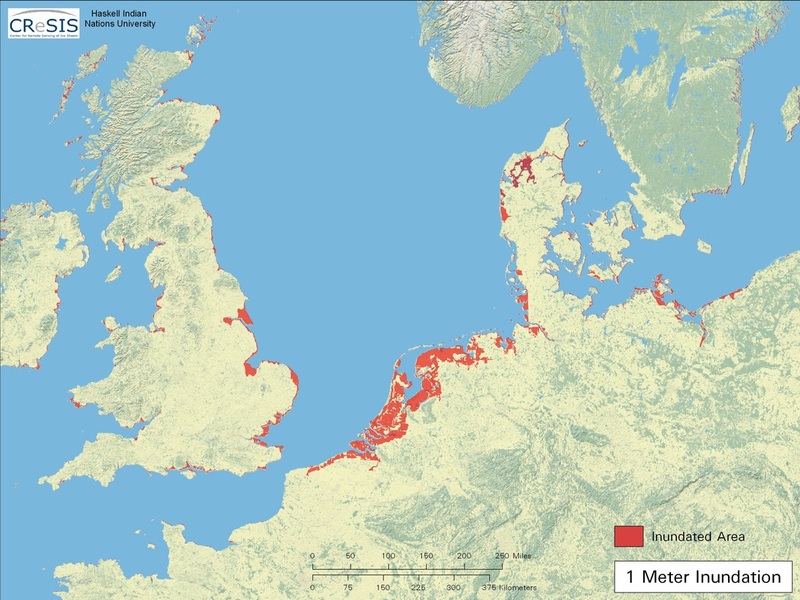 There is also a very detailed presentation on sea level change in the slideshare presentation, including a video explaining the coastal plain of Belgium. Submergent coastlines form as a result of sea level rise. The current period of sea level rise, caused by melting ice sheets and thermal expansion of the ocean is called eustatic change. As a result of eustatic change, a number of coastal features develop, including the formation of fjords, rias and fjards. Fjords are narrow, lengthened and steep marine gulfs that result from the inward movement of the sea into U-shaped valleys deeped by a glacier, during the last glacial period. They have a symetrical valley shape and vast channel depth that enables inland navigation. They are a renowned physical feature of the Norwegian coastline. A rias is a deep, sunken river valley drowned by the sea. They form funnel-shaped branching inlets, decreasing in depth and width inland. A good example can be found in the Solva in Pembrokeshire. Rias are different to Fjords in that the valley was previously shaped by river processes rather than glacial processes. Rias may show a meandering form as they navigate around spurs. Fjards are drowned glacial lowlands like thos found in western Scotland. 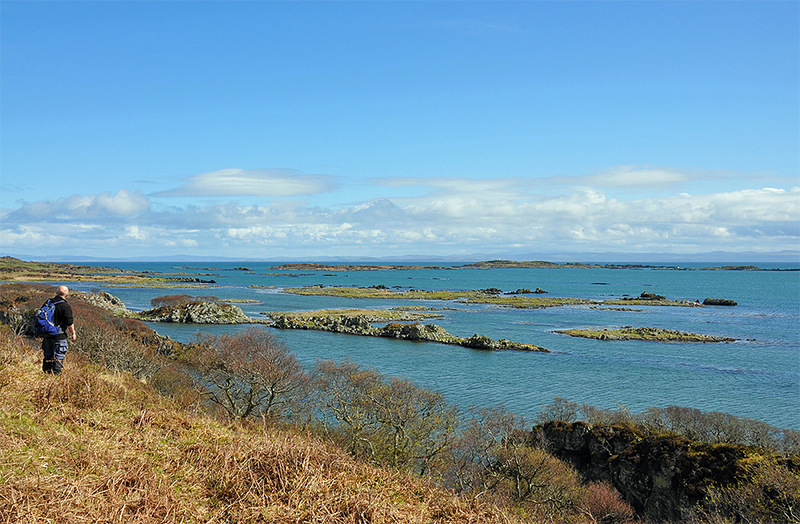 They are typically punctuated by small islands, called skerries that result from isostatic recovery. Predicting sea level rise over the next 100 years is a difficult process. The main problem is our lack of understanding of how ocean temperature reacts to atmpspheric temperature change. In addition, there is great uncertainty over what carbon emission track we will take in the future. The graph to the left shows projected sea level rise for three different emission scenarios. The semi-empirical method predicts sea level rise roughly 3 times greater than the IPCC predictions. Note the IPCC predictions are shown as vertical bars in the bottom right. For the lowest emission rate, sea levels are expected to rise around 1 metre by 2100. For the higher emission scenario, which is where we're currently tracking, sea level rise by 2100 is around 1.4 metres. It is generally thought that the IPCC has made very conservative predictions for future sea level change. The maps below show a realistic outcome of a 1meter rise in sea level, should global efforts to curb carbon emission continue to delay. 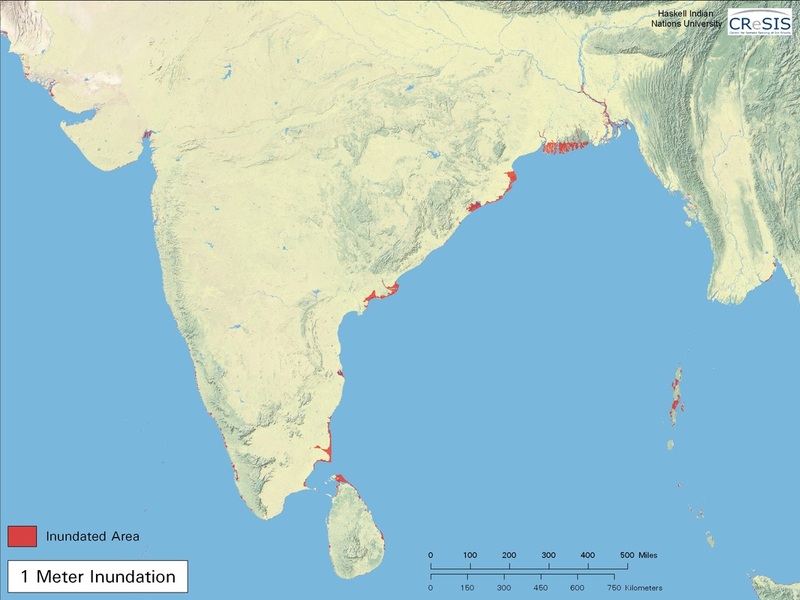 North Europe, especially the Netherlands and South Asia, in particular the Sunderbans region of West Bengal and Bangladesh will lose large quantities of land. Firstly, it is important to recognise that the impacts of sea level rise are already being felt in many places of the world. Millions has already been invested in the Deltaworks in the Netherlands and vast public funds are earmarked for continued maintenance and improvements to safeguard this densely populated region of North Europe. Elswehere, the Sunderbans region of West Bengal and the low lying delta of Bangladesh is amongst the fastest eroding coastlines in the world, with some places experiencing more than 20 meters of erosion each year. There appears to be an increasing frequency of cyclones with their associated tidal surges. In the Pacific Ocean, low lying island states are already suffering the worst affect of sea level rise, with increased rates of salinisation, coastal erosion and storm surges forcing many to consider migration. The following videos show the problems for Pacific islanders and people living in the Sunderbans. The following link to the PowerPoint on the potential impacts of sea level rise on East Anglia provides a useful regional case study for the UK. In adddition to impacts of flooding, governments and regional authorities need to make concrete and lasting decisions on how to manage the increasing rates of coastal erosion. Coastal erosion will have major impacts on local, regional and national economies. With the consequence of land loss and inundation a real possibility, very big decisions will have to be made on how to safeguard populations. This may involve embracing hard engineered sea defenses but it's difficult to see how that would be financed. Alternatively, decision makers may opt for softer approaches such as coastal reallignment, like that seen at Wallasea, (described on the next page for case studies) or even the abandoning of some coastal regions. However this decision to alllow vast areas of fertile farmland won't be taken lightly as such as decision would come with enormous soical and cultural losses to the regions affected.